7.5" x 15" x 14.75"
In the United States, people who seek advice go to those they believe to be wise and insightful-a grandparent, a parent, a minister, a teacher, a psychologist. In many instances the response or advice is given by way of a folktale, proverb, Bible story or example. These stories do not necessarily give direct answers but rather provide guidance through enlightenment, further thought, and contemplation. In the Yoruba culture people go to the diviner for assistance in problem solving. After listening carefully, the diviner seeks information from Ifa, the agent of divination. The diviner's box would be used in this process. Typically stored in the box are 16 palm nuts. A complicated ritual takes place and the nuts are then interpreted based on 256 signs. Depending on the sign (udo), a particular story, proverb or song is told by the diviner, who acts like Eshu, the trickster god who is a messenger between the gods and the people. The stories of gods, animals, and humans illustrate how one might resolve a problem. 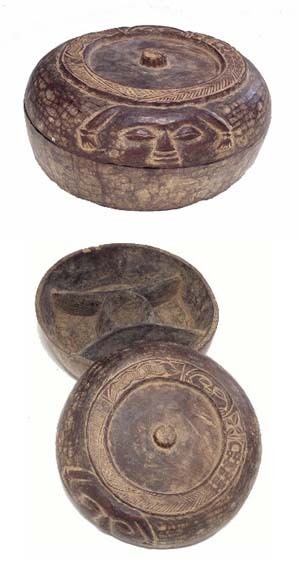 This diviner's box depicts Eshu on the lid.